Diet | Life Is Absurd. Don't Fight It. I was on facebook the other day, because I am human and live in the Western world. I’m not proud of the fact, and to be perfectly honest I feel that website has removed something of my soul which may now be lost to me forever. There are many reasons for this, and I would start listing them if I didn’t suspect you are already aware of many of them. That site steals our time and makes us anti-social while pretending to make us more sociable. Right, so her body is undeniably transformed, and she looks better for it. Thing is, her body already underwent one transformation – if you look at footage of her from the early Eighties, when she guested in The Young Ones and appeared in The Comic Strip Presents, she was a normal, everyday size. It’s weird, man. My friend mentioned this recently, because I lost some weight. Latterly, I also put some weight back on. It takes work and willpower to make the change, that’s a given – nobody ever ate themselves skinny. When you lose a noticeable amount of weight, though, everybody who notices it comments on it, or congratulates you. Very, very few people (aside from maybe a bitchy relative) comment on weight gain. 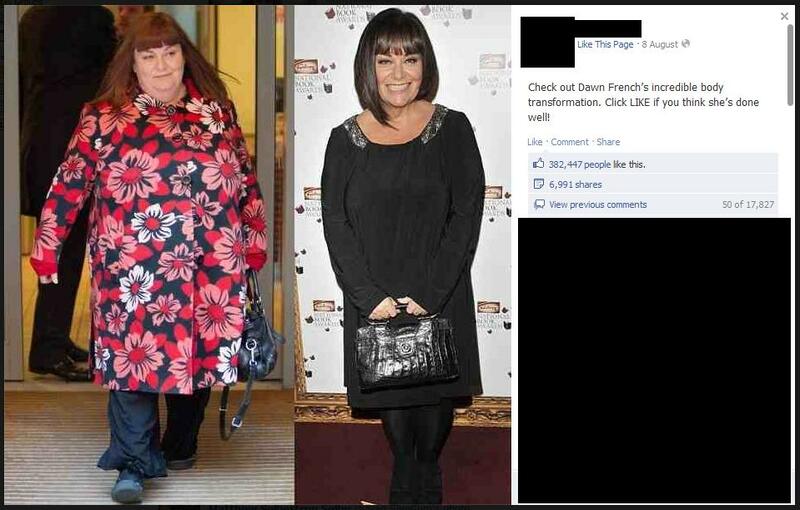 So, let’s click LIKE on Dawn French’s “incredible body transformation” now she looks a healthy weight. Just don’t acknowledge that other transformation, over the course of the 80s and 90s, when she doubled in size. We don’t mention that.